No. 77 Bowers and Wilkins FAZZT Race Team News and NotesThis is the first race event for the newly formed FAZZT Race Team. 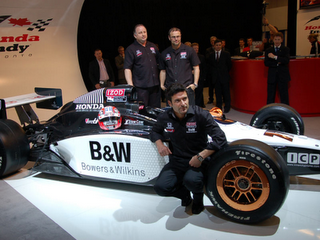 2010 will be Tagliani's first full IndyCar Series season and his 10th season of open wheel racing. Tagliani previously raced in the CART Series in Rio De Janeiro, Brazil and was the pole sitter of the event in 2000. Tagliani last drove at a test on Jan. 20 at Sebring International Raceway. "The FAZZT Race Team has done an excellent job preparing for this event. It will be the first race for us as a team but with the experience on our team it certainly doesn't feel that way. Starting the season in Sao Paulo will be good because it is a brand new track and everyone will start fresh and from the same page. No one has past information from this track so we will all be relying on our work during testing and applying that to the track. We tested well over the winter and I think we have a good place to start from on Saturday and that will be the difference for the teams this weekend as two days is not a lot of time to work on the car, you have to be happy with the car you brought to the track. I have only seen a video of this track and I think it will definitely be an interesting track to race and also a good track for the fans." The course is a 2.6-mile, 11-turn temporary street circuit comprised mainly of asphalt with a section of concrete in the Sambodromo area.